Kenton's Infotainment Scan: Don't smoke - we know who you are!! Perhaps the offender is a very good customer and they don't want to risk losing their business so they've tried the passive-aggressive approach? Did you offer to rewrite the sign to improve its flaws? 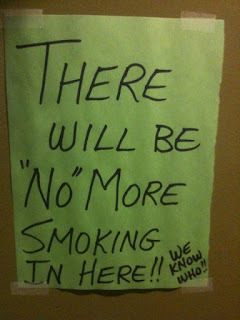 If I saw that hung on a door, I think I'd take the initiative and rewrite it, without being asked.